When I first started in social media marketing way back in 2010, I monitored a company’s Twitter account. The first thing told to me was this: Don’t follow everyone that follows you. Being a marketing noob, I absorbed this tidbit as fact and delivered as promised. When someone followed us, I simply did not click the Follow button. As my career weaved from state to state, from industry to industry, I upheld this habit like a marketing commandment: Thou shalt not followeth back. But a strange thing happened. I watched Twitter users follow us, then soon unfollow us. The accounts that followed us unrequited were mostly infrequent user accounts with high inactivity. In other words, we were tweeting mostly to users that signed in once a month. The funny thing is that I never followed this advice on my own Twitter account. Every time someone followed me on Twitter, I followed back. I didn’t even think twice about it. And guess what? Most of those followers are still following me. We reply back and forth to each other and even share each other’s tweets. The difference is that my goal is to form relationships. As company social media representatives, we strive for engagement. But most of us are kidding ourselves when we think that we want to create dialogue with customers. 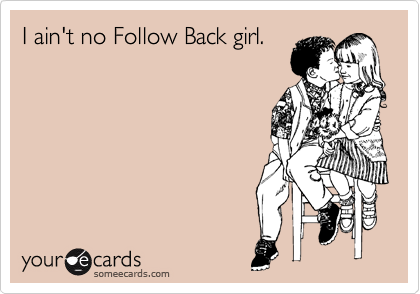 Because if you do not follow back, then your only engagement target is a steep follower-to-following ratio. Customers and potential buyers are knocking on your door when they follow you. Not following them back is like slamming the door in their face. Yes, companies often follow users that have proven themselves as loyal fans. But why do your customers have to prove their loyalty to you? It’s you who’s in business to sell something. You must first prove your loyalty to your customers if you want it in return. Think of it as the Golden Twitter Rule. Granted, those that do Twitter right will always have a follower-to-following gap. That’s because experienced social media users can recognize spam accounts. And it’s okay to not follow Twitter users that go against your values or interests. In fact, I look at my Twitter account’s following number to get a better idea on how many people I really am reaching with my tweets. I should not get excited when a big Twitter account follows me back. It really should be commonplace. But that’s exactly what happened one fine day when Slack followed me back. But I wasn’t a unique situation. The last I checked, they were following 88.4K users. That’s a lot of Twitter accounts! Following back shows your customer that you truly want to form a relationship, that you want to start a conversation, that you are listening to them, that what they say matters to you. Loyal fans aren’t born with pom poms in their hands. They are loyal fans because your company took the time to create an experience that they value. And that could mean something simple as a Twitter follow back. Do you #followback on Twitter? Share why you do (or why you don’t) below. 1) I look to see if they have any common interests… it’s not hard to find common interests with people, whether it’s professional, personal, political or otherwise, I have lots of interests and I have groups for each of those interests. Now while it’s not that I don’t want to build relationships with everyone, but I don’t expect folks who have no interest in the things I tweet about to strike up a conversation, so unless I can put them in a group, with rare exception I don’t #followback. 2) I then look at their “Tweets and Replies” tab. My goal is the same as yours, I’m interested in following people so I can build relationships with them. That becomes more difficult when you hit 1000, 2000 or more followers, but it’s not impossible. That said, if the extent of an account’s interaction with followers is “Thanks for the RT” or ” I appreciate you following me” then that’s not really a conversation is it? I’m looking for people who want to talk or who are engaged with the people they follow, not accounts that are just going to broadcast things they think will get them more followers. Great point, Derek! I really like your second suggestion. It’s easy to personalize a thank you tweet or add a question to it. And while Twitter profiles look cleaner with reply tweets under its own tab, it was much easier in the past to glance at a Tweeter’s true tweet history from one feed. Can’t wait to read your insights on next week’s chat! What other Twitter chats do you find helpful and engaging? The only other chat I find myself visiting regularly is #digiblogchat on Tuesday afternoons at 4pm ET. I’ve tried like crazy to get into the #cmgrhangout on Friday afternoons but it seems like I always get caught up in one thing or another and I wind up missing it. I find myself getting sucked into #sproutchat on occasion but I have client meetings on Wednesday afternoons so that one is challenging as well. The evening chats like #socialchat or #mediachat are good but with my kids and volunteer activities I find it hard to get into them. Hope to see you on another chat soon!